In a small skillet, heat the oil over medium heat. Once hot, add the onion, reduce heat to low and cook, stirring occasionally, until completely softened and caramelized, about 5 to 7 minutes. Scrape the onions into the bowl of a food processor. Place the skillet back over low heat, add the walnuts and let them toast, stirring occasionally, for 3 minutes. 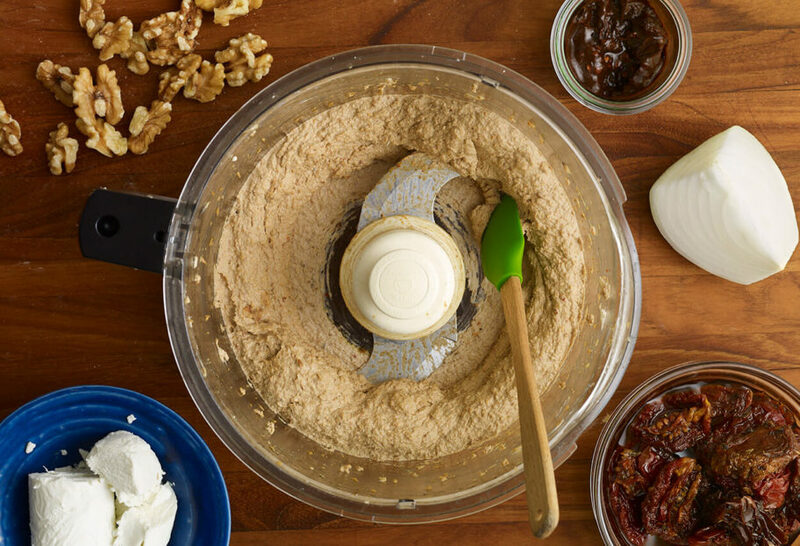 Add the walnuts to the food processor along with the chipotle chiles, sundried tomatoes, goat cheese, salt, and freshly ground black pepper to taste. Process until smooth. Use immediately or store covered in the refrigerator. Oh my stars – this is better than I ever expected! Even my husband who is not a very adventurous eater (I’m working on him though ;)) said this was absolutely delicious. I’ve been on a Pati recipe binge in my kitchen and he even said “thank you Pati!” as he scarfed it down. I made the BLT you suggested in ur season 6 episode. I’m glad I doubled the recipe. I’m so happy to have found you <3 my 3 year old even watches you with me and is always asking questions about ur cooking. I love introducing her to new & different foods and watching her enjoy it all come together. God bless you and ur family! Aww give your 3-year old a big hug from me, Laura! Hi Pati, My Husband and I Love your recipes. We have so much fun cooking them together. We want to try this spread but, we are not partial to goat cheese. Is there another cheese that you could recommend. Thank you so much. Thank you Donna. You can use feta, cream cheese or mascarpone also. Say hi to your husband! Hi Pati, I recently “discovered” your show and absolutely love it! I can’t wait to try this recipe on your BLT. I was able to find Chipotles in Adobo Sauce easy enough. However, when it comes to the Sundried Tomatoes in Oil thus far I’ve only found: Sundried Tomatoes in a Plastic bag OR Sundried Tomatoes in Oil with Italian Herbs. I was wondering if you had any suggestions? I’m so glad you discovered the show, Heather! You can use the dried ones if you can’t find them in oil. You can re-hydrate them in a bit of warm water, so that they are easier to blend into the spread. Patient, you are such a joy to watch. I am new to seeing your show on tv. I am going to make the goat cheese spread tonight and try it on a burger. What do you think of that idea? I’m thinking it will be like having a pimento cheese burger in the south. Love your show. I just made this dip and it tasted even better than I thought!! I bought all the fixings for a blt tomorrow, I am definitely looking forward to it. But it tastes great on its own and with yellow and orange bell peppers. Hi Pati! Always love watching you! Would I be able to make this in advance? Wanted to make Thursday night and use Saturday. Thanks! Yes, it can be made a few days in advance, and kept tightly sealed in the fridge. I have tried several of your recipes. Love the show. It is fun seeing your family. Thank you so much Scott!! Absolutely or you can leave the nuts out if you have an allergy. I’m so glad you made it your own and added some pizzaz! Thank you Mike, I added it to the directions! You add it when you add all the other ingredients to the food processor. I made this today and it is awesome!!! Thank you so much for the recipe! It was a huge hit! I have to bring and appetizer/hors d’oeuvre to a party and thought this would be nice and different. Would it work well with crackers and chips type of thing? Hey Pati…when do I add the chipotles? Doesnt show in your directions..